A belief that Jesus survived the crucifixion and spent his remaining years in Kashmir has led to a run-down shrine in Srinagar making it firmly onto the must-visit-in India tourist trail. I am making my response to the following part of the comment by Crankthatskunk into a separate post. (His other points I will attend to later on under his comment). 3- I repeat once again, take my “Butler test”; not the hilarious fudge you showed last time, then find out; how I am compare to them. Find out who is going to run. Why don’t you take me on? Zahid, let’s face it, you are gutless, you very well know I will destroy Mirza’s credibility and the basis of your cult. You will never ever take that chance, because you know I will fulfil my promise if you ever show foolishness to go to court of Law against someone like me. Do this and you will find out the bitter truth. I just laugh at your hypocrisy, lack of courage, and your capacity to make lame excuses. Crankthatskunk asks me to give him the chance to take me to court. Here it is. His challenge to a debate is quite fake and fraudulent because he is on the side of those who oppress and persecute Ahmadis and who prohibit Ahmadis from expressing their views as is done in Pakistan. He is therefore lying when he says he wants a debate with Ahmadis, because what he supports and wishes to see is that their voices are strangled. Crankthatskunk poses the danger of inciting people to murder Ahmadis. The organisations he supports have already murdered Ahmadis and burnt their properties. I speak as one whose close personal friend, and Ahmadi Imam, was shot dead at point blank range in 1986 by a man motivated against Ahmadis by the kind of hate-inciting propaganda that Crankthatskunk is spreading. Crankthatskunk believes that Ahmadis are murtadd (apostate) and that it is the duty of Muslims to kill apostates. His question number (3) makes it clear that he believes in a violent jihad against the British government (because it was this war-like striving that Hazrat Mirza Ghulam Ahmad said was against the Quran). Crankthatskunk clearly wishes to incite Muslims in Britain to resort to violence against the state. He is therefore a risk to peace and order in the UK. This should give Crankthatskunk sufficient grounds for instituting defamation proceedings against me. I used to be puzzled when, searching for terms in this blog which I knew should be found, I would not get any results back. Other readers may have had the same experience. I then realised that the default WordPress search was only searching the initial posts, and not the subsequent comments on the posts. Today I have added a plug-in which searches comments as well. I have tested a search before and after installing the plug-in, and confirmed that it does search comments. Each search result is a link leading you to the start of a post, plus its comments, within which the terms occurs. To reach the term on that page, you can do a ‘find’ in your browser (In IE: Edit > Find on this page. In Firefox: Edit > Find. In Google Chrome: ‘Control the Current Page’ > ‘Find in Page’). In the immediate aftermath of the 1974 declaration of Ahmadis as non-Muslim, some people in Pakistan issued announcements that they were not (or were no longer) Ahmadi but were ‘Muslim’. This was done usually in order to avoid facing intense hostility, discrimination, social ostracism etc. To convince their friends and acquaintances that they really meant it, they cut off all connection with the Jamaat, discarded any Jamaat books that were in their homes, strictly forbade any Ahmadi who was visiting them from making any mention of the Jamaat while in their houses, etc. A person then middle aged became elderly. The elderly have a tendency to forgot recent events while their impression of events of longer ago remains strong. They often find comfort in regressing to a time sixty or seventy years ago. The person who did all the above in 1974 has a hazy memory of the denial, but does clearly remember times before that and starts speaking with affection about the Jamaat elders of those times! I wonder if according to the Maulvis such a person is now a murtadd, perhaps a “memory-loss murtadd”! Another event in this connection. In Pakistan a person grows up in a “denial” household and impresses upon Ahmadis that for the sake of their own safety and lives they must deny being Ahmadi and become ‘Muslim’ under the Constitution, which he is proud of being. Time passes. It is 2005. The person happens to come to U.K. where the train bombings have just taken place in London. The police are on the look out for Pakistani or Muslim looking people travelling on trains wearing backpacks. The person tells his friends that he is worried about being needlessly picked on, while being a wholly innocent person. Now his convenience lies in not being thought of as a Muslim! I joke: If I was stopped and questioned I would show the authorities the Pakistan constitutional amendment and some anti-Ahmadiyya literature and say, look I am a non-Muslim according to the “entire Muslim Umma”, and in fact our Founder has been declared by them as being your (i.e. British) agent! Posted in Ahmadiyya issues | 10 Comments » | Read more..
By declaring Allah as one’s God, one is barred from either thinking or acting like a god himself unto others neither taking others as god unto oneself. This declaration fundamentally humbles and unburdens mankind from shackles of arrogance, myths and fears of life, thus unleashing human potentials. Yet, it is the very objective of Islam to revive godly attributes in one-self. By declaring Muhammad as the messenger, the oath assigns a human status to Muhammad and prevents the Muslims from attributing super human qualities to him. Unlike other religions whose followers, out of love for their respective messengers, coupled with their ancestral and inherent idolatrous traditions, over a period of time started attributing godliness to their messengers. In contrast, this oath preserves the fundamental immaculate monotheistic nature of Islam. In light of the Kalima, it does not behoove the holders of majority point of view to act as God towards a minority opinion; else they are contravening the basic oath of Islam. Having the audacity to declare another adherent of this oath a Kafir is extreme form of arrogance. 5:61 When they come to you O believers, they say, “We believe”. In fact they come in disbelief and depart in disbelief. God knows best what they conceal. 5:62 You will see many of them race towards actions that drag down the human potential, create division in the society and they earn wealth through illicit means. Indeed condemnable is what they do. 5:64 (The Divine System wants people to contribute to the society) The Jews say, “God’s hand is tied down.” It is their hands that are tied down. Their uttering deprives them of God’s Grace. His hands are wide open and He showers His Bounties according to His Laws. (O Prophet) Since the Revelation given to you by your Lord brings about a benevolent revolution in the society, people with selfish interests hate it. Many of them plunge deeper into transgression and disbelief. Consequently, Our Law has sent down into their hearts and ranks animosity and hatred until the Day of Resurrection. God has put down the flames of war that they repeatedly ignited. They try to create corruption and disorder in the land and God does not love the corruptors. At the time of revelation of these verses, the transgressors were people belonging to older interpretations of the scriptures. Now that we have Quran for more than fourteen hundred years, these verses squarely include the arrogant Mullahs and their followers as well. With this in mind, please re-read the verses above. Ka`ba Sharif, and Madina Munwara are in our land; Holy Prophet Muhammad SAWS came among us; Holy Quran was revealed in our language and dialect; we are in position to best understand Islam and decide who is Muslim and who is Kafir; for us it is not important whether non-Wahabbis recite Kalima Shahada, offer prayers 5 times a day, fast in Ramadan, pay Zakat, and perform Hajj. We declare all non-Wahabbis are Kafir. Question: Does anyone think that this new law of Saudi Arabia government is justified in light of Holy Quran and Sunna? All non-Shias are Kafir. Do you think this new law of Iran to declare non-Shia reciters of Kalima-Shahada is justified under Holy Quran and Sunna? In reply I get deafening silence. Does it mean, you will agree with Saudi Arabia government to NOT allow any non-Wahabbi reciter of Kalima-Shahada to perform Hajj? Of course in reply I get deafening silence. If Saudi Arabia Government FOR WHAT EVER REASON declares NON-WAHABBI reciters of Kalima-Shahada INCLUDING YOU as KAFIR and STOPS you from performing Hajj, are you going to accept it that you are KAFIR and you deserve NOT to perform Hajj? As usual I don’t get reply. It is with great sorrow that we announce the passing away of His Eminence Sheikh Muhammad Syed Tantawi. The Sheikh was the Grand Imam of Egypt’s prestigious Al-Azhar University. He passed away in Riyadh, where he was attending a conference, because of cardiac arrest at the age of 81. Inna Lillahi wa Inna Ilaihi Rajioon. 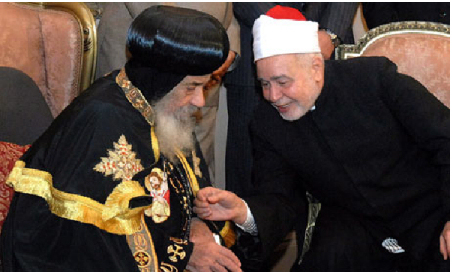 His Eminence Sheikh Tantawi was a prominent voice in the world of moderate Islam. When the book The Religion of Islam by Hazrat Maulana Muhammad Ali, the late Head of the Lahore Ahmadiyya Movement, was translated into Arabic he was asked to review the manuscript and to write a foreword. After reviewing the manuscript he wrote a very favourable foreword praising the book and Maulana Muhammad Ali. He asked his personal printer to give his advice on how best to print and to publish the book. His personal printer also printed the Arabic translations of other books by Maulana Muhammad Ali such as Muhammad the Prophet, Living Thoughts of the Prophet Muhammad and A Manual of Hadith. He regarded the Lahore Ahmadis as Muslims and spoke well of us. He would quote from the book The Religion of Islam in his articles. Sheikh Tantawi showed his support for this jamaat by saying that we should not worry about criticism. He would throw newspapers containing abusive articles about Lahori-Ahmadis in the waste paper basket. His enlightened leadership will be greatly missed by moderate Muslims. May Almighty Allah admit him to His mercy and grant him a place in paradise. Submitted by Rashid. This was originally a comment, which is being converted into a new post. More and more opponents of Hazrat Mirza Ghulam Ahmad are inadvertently adopting his approach to solve Muslims conflicts with non-Muslim people, nations and countries. Today in an event in UK, well covered by media, Tahir ul-Qadri has issued Fatwa against militant approach of Muslims. His target audiences are Muslims all over the world, including countries in which Muslims are fighting against occupation. ‘Powerful attacks’ are forcing Muslims to accept HMGA by accepting his approach for revival of Islam. Alhamdolillah, we are witnessing fulfillment of Allah’s promise and HMGA prophecy. Hopefully, HMGA opponents this time won’t say his prophecy did not fulfill.